Each year, one of the best parts of my ETA grant was the WORDS Competition, and it was definitely something I was looking forward to as part of my current position. While working towards WORDS from behind the scenes was certainly different, and I very much missed working one-on-one with my students while they prepared for the competition, I was still very excited for the national competition in Jakarta, especially as this year marked the tenth anniversary of the WORDS Competition. One of the participants performing traditional dance. Each of the students was amazing. Students chose to be cicaks in castles and museums, Kartini’s room of confinement and Nikola Tesla’s lab. Some speeches were comedic, others inspiring, and still others made the audience cry. For their talents, students danced, sang, performed traditional martial arts, and more. The audience was captivated, and the judges—who included two past WORDS winners—certainly had a tough job in selecting the winning participants from such talent. The night after the competition, there was a group activity planned for the students. I had not initially planned to join, as the activity is usually exclusively for ETAs and their students, but a few ETAs were sick, and an additional chaperone was needed. The original plan to go to laser tag fell through because of traffic, but we all took the students to see movies, and it was a grand time anyway. To commemorate the 10th anniversary of the WORDS Competition, an additional event was added to the experience: English Fun Day. I won’t deny that I was not exactly thrilled at finding the planning I had to do for WORDS doubled in comparison to previous years, but we managed it, and the end of the day the envent went fairly well. English Fun Day was held at @America and in addition to the WORDS Participants and their ETAs, also included participants from two Jakarta-based organizations that serve disadvantaged children: Ticket to Life and Sahabat Anak. Several groups of ETAs developed storytelling, song, and game activities in which everyone could participate, for an afternoon of fun and English language learning. All of the students, the WORDS participants and our guests, were enthusiastic and adorable, and though managing such events means that you rarely are able to stay in one place for too long, I loved what I was able to see. Everyone at the DCM’s house. During their time in Jakarta, WORDS Participants were also able to explore the capital city with a visit to MONAS, while the ETAs had a meeting about their last weeks at site. And following the English Fun Day, all students and their ETAs were also kindly invited to a farewell dinner at the residence of Deputy Chief of Mission Brian McFeeters. Though I know shamefully little of the DCM’s work and policies, I will say that he has a wonderful way with young people, and the WORDS students adored him. The few days dedicated to WORDS were, of course, hectic and stressful. This job always is. But unlike most other things in my current position, WORDS involved the young people I love so dearly, and feel most passionate about working with. WORDS, for me, was a breath of fresh air, and way for me to group myself in the reminder that when this grant is over, I will return to work more directly in education, where I truly belong. I loved every minute, and I still cannot quite believe that I was able to enjoy a third WORDS Competition, something very few people have the opportunity to do. Whatever insanity led up to the competition, I feel so blessed to have been there, and I wish all of the participants the best of luck for the future. All of the WORDS participants, their ETAs, and the judges. A cicak is a small lizard. 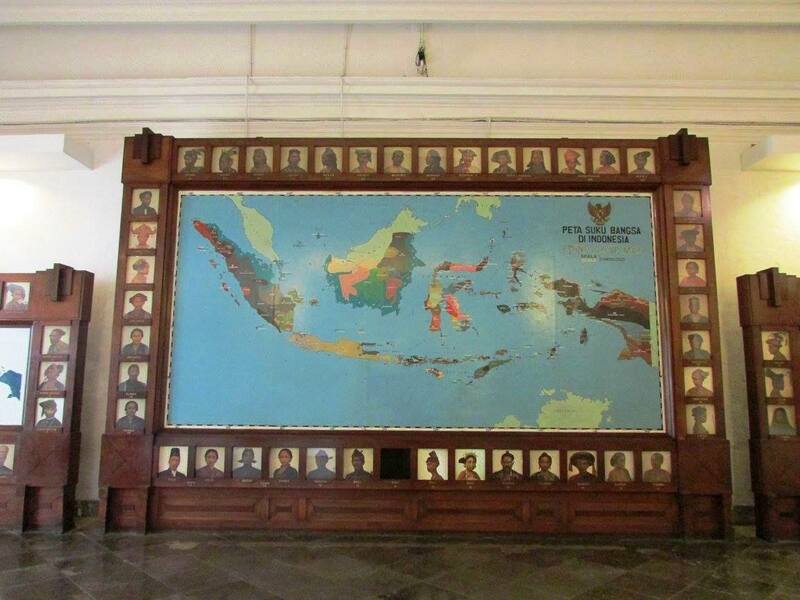 ETAs changed originally chose the theme “Fly on the Wall,” and then changed the Fly to Cicak in order to make the theme more Indonesia-centered. There are many things that I absolutely adore about teaching in Indonesia. I love the energy of my students, which sometimes does need some reigning in, but honestly is the reason I show up to work every day. In the States, one of the biggest challenges of teaching high school, in my experience, was creating excitement and enthusiasm. That is already there every time I walk into any classroom here. Taking class outside, because, well, why not? I love the way the outside world begins where the classroom ends, and we just have to walk out the door if we want to take class outside. There is no trekking down the hallway, there is no making sure alarms won’t go off if we go into the courtyard, as there is in so many northern U.S. schools. We just step out of the classroom, and… there we are. I love how quickly my students help one another, how they support students who struggle with English to keep up, as best they can, with the rest of the class. I love how easy this makes incorporating group work into the classroom. I love how the relationship between students and teachers is much more informal than it is in the States: teachers seem more like parents than the distant professionals various regulations have forced U.S. teachers to be. I love the way all of my students take pride in the class they come from, the way their class becomes a sort of family. I love the way the whole school feels like a family, like a home. But there is no denying that teaching in Indonesia is also a considerable challenge. One of my classes didn’t have a white board for a while, so we used the floor instead. I laugh now at how much of my own training to become a teacher focused on the use of technology in the classroom, as I now work in classrooms with one whiteboard, no markers unless I bring them myself, and a few shared projectors that can’t be used half the time because of mati lampu. The classrooms are hot, and often packed with far more students than I would ever recommend in one class. Sometimes, there are not enough chairs for all of the students. The students take too many classes. My students take anywhere from fourteen to seventeen classes during their six day school week, and this leaves a mere hour and a half each week for English. I remember being in college and taking seven or eight classes in a semester, rather than the recommended six, and finding that I was never able to find as much time as I wanted to dedicate to each subject; I can’t imagine how my students survive. Teachers show up late to class, or not at all, and there doesn’t seem to be any real accountability for them. And there is no system of substitute teachers in Indonesia, which means the students are left alone for that period. Students come late to class and skip class too, generally coming to school but hanging out in the canteen when they don’t feel like going to class. The teachers reprimand them, but in some ways I can’t blame them, what with the examples they see every day. Every day, I navigate the ups and downs of these joys and frustrations. Perhaps the most difficult part of this is differentiating when something is particular wonderful or vexing because it simply is, or because it is so different from the American context in which I am accustomed to learning and working. I do my best to consider everything as objectively as possible—which makes me pretty confident in my critiques of classroom size, but less so in regards to just how advantageous collectivism in the classroom is—but the truth is I will never really be sure. One of hardest things about teaching in Indonesia, for me, is not having a consistent space in which to teach. In Indonesia, the students do not come to the teacher; the teacher goes to the students. This means that I need to be able to carry all of my supplies for a lesson with me, and they need to work in ten different classrooms with ten different set-ups. This means my students sit in the same classroom all day. This means I cannot leave permanent learning spaces in the classroom. It is maddening. At the beginning of the second semester, my school moved the entire tenth grade to a new building, leaving the old tenth grade classrooms empty. We had just used the required content of diary entries to compare and contrast American and Indonesian schools. I saw an opportunity. I took it. In one of the classrooms left empty by the tenth grade move, my teachers and I have created an American Classroom. It started as an experiment, as a one-week trip to give them a taste of what they had read about and we had discussed. But the students and my co-teachers loved it so much that English Class is now held in the American Classroom every week, and I use the space for all of the after-school English activities I run as well. Students flock to the world map in the back of the room when they arrive, pestering me with questions about different countries on the map (ever so thankful for my high school geography class now). On the way out they take selfies with the American Flag while making jokes about how they are in the U.S.A. And they tease me for refusing to take down the Indonesian Flags on the ceiling: “This is the American Class, Miss!,” while I insist on the beauty of campur (mix). When they are assigned to present on a hero of their choice, a handful of students in each class pick the American social justice leaders whose inspirational quotes are displayed by the door. Students using the Irregular Verb Word Wall for a poetry exercise. But it’s not just about the decorations. It’s about creating a permanent space to learn in. When it was time to incorporate biographies into the tenth grade curriculum, I was able to create an interactive gallery walk about famous Black American heroes, something that, had I needed to move it to each of my ten classes, would have taken too much class time to set up to really be feasible; those same biographies now line one of the classroom walls, and some of the eleventh graders, visiting the American Classroom after school, recently read through and asked me questions, thereby extending the Black History Month lesson well beyond only the classes I teach. I have created Word Walls of all the new vocabulary they were exposed to last semester, and of the irregular verbs they have been working with so intensively this semester; not only does this act as a great resource for students while they are doing their work (no more leafing through the notebook for those words they cannot remember), those students who tend to finish work a bit more quickly go to these Word Walls when their assignment is finished, extending their vocabulary. Upon the request of my co-teachers, I will be adding more quotes and reading materials for some of the other walls, to provide more extended practice for high-achieving students. Students are currently working on their own poems, and I plan to display that poetry on one of the walls which, for now, is intentionally blank. There may only be three months left in or grant, but I already have so many ideas as to how to use this new space for future lessons. The kind of lesson that just wouldn’t really be feasible without the American Classroom. I don’t think I’d be exaggerating when I say that every aspiring teacher dreams for the day when they have a classroom of their own. I ended up with my first classroom in a fairly untraditional fashion, in a borrowed, faded, unused classroom, devoid of desks and chairs and with broken windows and a whiteboard that had to be re-nailed to the wall. But as I sweep the classroom floor before school, and students start to file in early (usually stealing the broom from me in the process—it is considered disrespectful if they let their teacher do the classroom cleaning), firing questions off right from the beginning about whatever it is I have added to the wall or written on the board that week, satisfaction settles in around my smile. What I have is a classroom that is a blend of American and Indonesian traditions, with both an American and an Indonesian teacher, with some of the loveliest students any teacher in the world could ask for. Who needs desks? Waiting for students to arrive. This probably comes from the culture of collectivism that prevails in Indonesia. Collectivism is complicated, with plenty of positives and negatives alike, and I don’t fully understand it yet, but I do so love this one element. Most of the teachers I have worked with are not actually all that distant. But there is no denying that any time a student would give me a hug there was bound to be someone telling me to be careful about physical contact with students, and I could really only get away with it at all because I am a woman. This is not the case in Indonesia. Students and teachers touch all the time (though gender does play a role, still). This year, my largest class has thirty-six students, which is pretty close to the average class size in Indonesia. Last year, I had more than one class with forty students in it, and fellow ETAs have taught in classes pushing fifty students. In comparison, the average U.S. High School Classroom, according to data from 2012, is 26.8. Objectively, I know this experience will make me a much stronger teacher in the future, especially if, instead of becoming a more traditional classroom English teacher, I go into ESL education and work in a variety of classroom alongside other subject teachers. Nonetheless, I am an American teacher trained with the expectation of someday having a classroom space of my own, and the lack thereof wears on me. MAN Model is a big school. I teach ten classes every week, and that doesn’t cover even the entirety of the tenth grade. Trying to reach the larger student population and offer my services as an ETA is a daunting task. Fortunately, generations of ETAs before me have been fighting the same battle, and I had numerous ideas I could attempt to implement. A friend from last year’s co-hort had waxed rhapsodic about her “English Corner,” a white board in the school courtyard on which she could put up information about English Club and other English-related activities, facts and figures about American Culture, and short English challenges for students to try. I seemed to remember that the ETA who was at my school last year—a fabulous individual very much missed by her students—had also had an English Corner (I was right). So in mid-October I approached the English teachers to ask if it might be possible if I could set up an English Corner as well. They were completely on board, and one week later there was a shiny new white board at my disposal. The English Corner when it first began. The middle school teacher in me was thrilled. I love bulletin boards, but I haven’t had too many opportunities to work with them, since I have yet to have my own classroom. I bought copious amounts of colored paper, foam, and patterned tape, and set to work. In many ways, the English Corner was an immediate success. Students flocked to it between classes, and all I had to do was sit on a nearby ledge during breaks in order to have the opportunity to talk to the eleventh and twelfth grade students who wanted to practice their conversational English. My own students asked about and commented on parts of it after class, and even the teachers got excited when something new popped up. Students interacting with the English Corner during a break in-between classes. But it wasn’t perfect. My English Corner throughout the first semester a little too ambitious. I created six different sections of the English board: “Daily Word,” “Weekly Idiom,” “Weekly Challenge,” “Monthly Project,” “News,” and a section which I intentionally left blank, so that I could use it in any way I needed. I vowed to change out these various parts of the English Corner accordingly. I thought that was completely doable. I was wrong. I had ten classes which I co-taught with four different teachers, English Club, Bahasa Indonesia lessons, various off-campus commitments, and my responsibilities as a returning ETA. I often found myself overwhelmingly busy, and when I had to cut drop something from my daily to-do list, it was often my English Corner. The “Daily Word” section would stay the same for three or four days in a row, the “Weekly Challenge” wouldn’t be updated until Wednesday. I had clearly bitten off more than I could chew. The completed “Thankfulness Tree” at the end of November. I was also continually fighting the location of my English Corner. The wind would steal the sticky notes on which my students had written their favorite hobbies. Elementary school children who would play in the courtyard after school would take the leaves I had painstakingly cut out for the Thankfulness Tree (I don’t really blame the kiddos—they had no idea what they were for, and who wouldn’t want a bright red leaf to take home with them?—but the amount of time I spent cutting out leaves in the month of November was a bit ridiculous). All of this, while somewhat frustrating at the time, was an opportunity to learn, and improve. When I came back from my December travels and the new semester began, I made some pretty significant changes to my English Corner. I decreased the number of sections, and I completely eliminated anything that required me to change a section daily or weekly. One student’s contribution to the “New Year’s Resolution” project. Meanwhile, I kept the elements of the English Corner that had already proven to be really successful. The students love interacting with the English Corner and filling it with their own words (and if I’m honest, I’m really fond of that as well), and so I am always certain to include elements of that. But this time, instead of using sticky notes, I tape a whiteboard marker to the side of the English Board, and have students write their responses. I also make sure to include lots of culture, for my ever-inquisitive students whose curiosity is absolutely insatiable. And since then, my English Corner has bloomed. My most recent English Board included multiple sections related to Black History Month, including a focus on Black American Heroes, a timeline of important dates in Black American History, and a word bank full of vocabulary they need to understand those other sections. The other sections were an interactive section in which students could write about their own heroes, and information about an upcoming English speech competition. A crowd of students helped me to put it together; they were so impatient to see what the updates would bring. The most recent English Corner. A little faded, but still going strong. I am incredibly thankful for this opportunity to learn from my past attempts in order to create something more useful for my students. At some point during my time as an undergraduate education major, I remember a professor explaining what she felt the difference was between the lessons from a new teacher and an experienced one: the lessons of the experienced teacher are less flashy. While the young teacher is determined to be bold and exciting, the experienced teacher doesn’t want anything to do with bells and whistles. The experienced teacher wants tried and true, she wants what she knows will help students learn. This is not to say the experienced teacher is boring, or that the new teacher is not in any way effective. But the experienced teacher has had time to tweak lessons and classroom elements, fiddling with its wires and gearboxes, so that even if the paint isn’t quite as bright, it runs like a dream. As I take in my new English Corner, with its faded lettering and slightly-dusty edging, I can’t help but feel this is true. My English Corner no longer looks as flashy as I might have once dreamed it would, but that’s okay: it’s more effective as it is.